Synthetic peptide within Human Aldolase aa 1-100. The exact sequence is proprietary. WB: A549 and HeLa whole cell lysate (ab150035); human fetal brain, fetal liver and skeletal muscle, mouse brain, rat brain tissue lysates. FC: MCF7 cells. Our Abpromise guarantee covers the use of ab169544 in the following tested applications. WB 1/1000 - 1/10000. 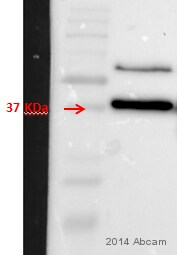 Predicted molecular weight: 39 kDa. Carbohydrate degradation; glycolysis; D-glyceraldehyde 3-phosphate and glycerone phosphate from D-glucose: step 4/4. Defects in ALDOA are the cause of glycogen storage disease type 12 (GSD12) [MIM:611881]; also known as red cell aldolase deficiency. A metabolic disorder associated with increased hepatic glycogen and hemolytic anemia. It may lead to myopathy with exercise intolerance and rhabdomyolysis. Belongs to the class I fructose-bisphosphate aldolase family. Flow Cytometry analysis of MCF7 (Human breast adenocarcinoma epithelial cell) cells labeling Aldolase with purified ab169544 at 1/20 dilution (10 µg/ml) (red). Cells were fixed with 4% Paraformaldehyde. 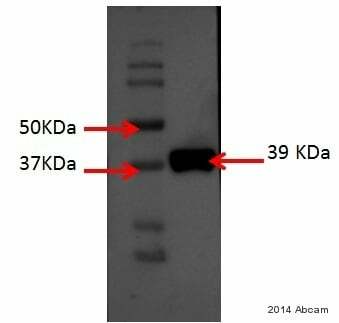 A Goat anti rabbit IgG (Alexa Fluor® 488) secondary antibody was used at 1/2000 dilution. Isotype control - Rabbit monoclonal IgG (Black). Unlabeled control - Cell without incubation with primary antibody and secondary antibody (Blue). Publishing research using ab169544? Please let us know so that we can cite the reference in this datasheet.